Home > Sweepstakes > Top Sweepstakes Round Up: Scholarships, Cash, and More! Top Sweepstakes Round Up: Scholarships, Cash, and More! Not a huge list of sweepstakes this week, but the Google scholarship contest looks really cool. 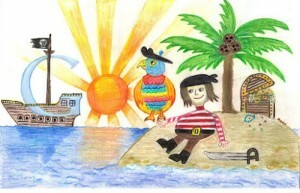 Your child, k-12, can draw a picture on the word “Google” for a chance to be featured on the site! The 2012 winner is pictured above.